GET TO KNOW YOUR HYUNDAI. 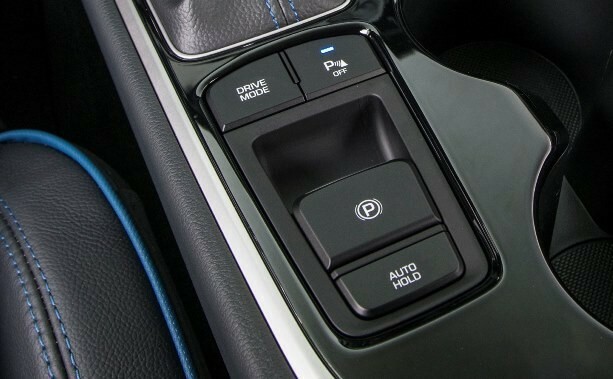 Learn about the Auto Hold feature, available on the 2018 Santa Fe, Sonata & Elantra GT. Did You Know Your Hyundai Could Do This? With so many features packed into vehicles these days it likely your car can do some amazing things that you never knew about. On this blog we aim to highlight some of the lesser-known features that make your Hyundai so amazing. Today we are talking about the Auto Hold feature, which is available on the 2018 Santa Fe, Santa Fe XL, Sonata and Elantra GT. The Auto Hold feature keeps your vehicle at a complete stop without you having to keep your food on the brake pedal. All you have to do to engage is press the Auto Hold Button (located to the left of the gear shift). to engage this features. Keep in mind the Auto Hold will not engage if the driver’s door, engine hood or rear life gate are open. Once engaged a white “Auto Hold” indicator will appear on the dash. Now when you come to a complete stop using the brake that indicator will turn from white to green. Then you can release the brake and the car will remain stationary. When you push the accelerator Auto Hold is automatically released and you start to move. Auto Hold will turn off automatically when you turn the car off or you can turn it off simply by pressing the button again. This feature will give you a little bit of a break when you find yourself in stop and go traffic or waiting at long stop lights.